Best pillow for side sleepers with arm rest under pillow. We believe in better tomorrows. We frequently hear the stories of people with sleep disorders and other sleep problems finally waking up feeling completely rested and ready to take on the day when they switch to the better sleep pillow (BSP). Stomach and side sleeper pillow that allows comfortable positioning without putting your arm too sleep and head/neck out of whack. 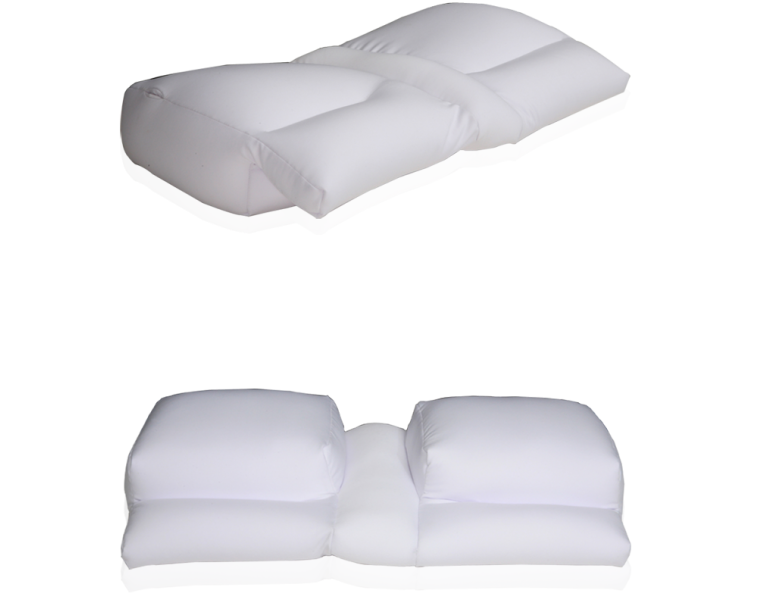 “Try At Home Free” program - You get to Test Ride these pillows in your home for 14 Days - 100% Risk Free. Shipping is on us both ways! Try At Home Free” is our new product line launch program to get the word out and bring in review. Act Today this maybe gone Tomorrow. Waking up every morning feeling that you've had a refreshing full-night's rest that leads to better mornings and more productive days. According to Australian researchers in a 2007 peer-reviewed study: "It is clinically accepted that a change in sleep position may benefit the systematic health of individuals." Face down. Fetal position. On your side. On your back. Assuming different positions and shifting in your sleep is only natural. This is why we designed the ergonomic Better Sleep Pillow (BSP) to shift with you, allowing multiple positions for your arms, as you are repositioned in your sleep. Our mission was to create a universal sleep pillow that accommodates any type of sleeper and delivers everything you could ever want in a pillow... and more. Why Choose the Better Sleep Pillow? The BSP is easy to clean with its cotton removable zipper cover that is machine washable. The BSP is soft enough to cozy up to, yet maintains ample support with its quality design made to last throughout the years. People who snore no longer need to be embarrassed because the unique positioning of the BSP provides proper positioning that reduces and often eliminates snoring. 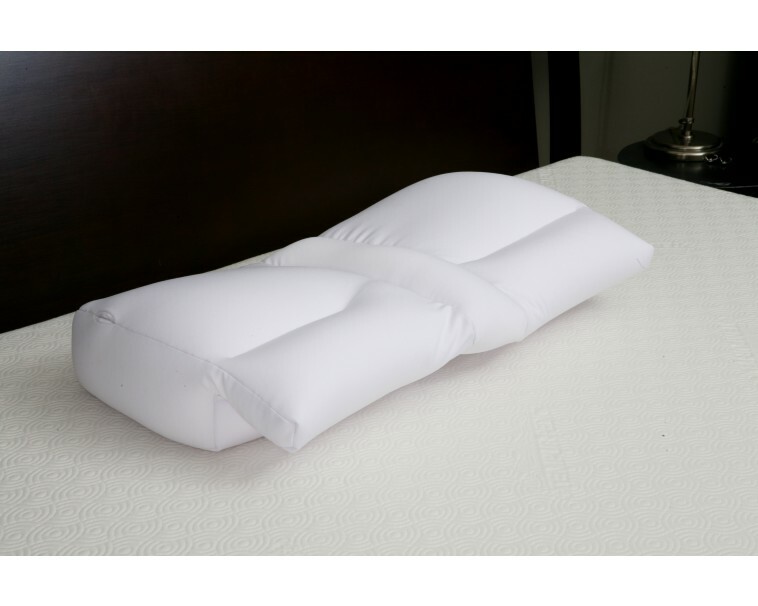 Those who suffer from back pain can experience decreased intensity and frequency of pain due to the proper neck and spine alignment provided using this sleep pillow. Stomach sleepers and side sleepers love the BSP because of the innovative "Arm Tunnel Systems" that keeps your arm in a comfortable position throughout the night. 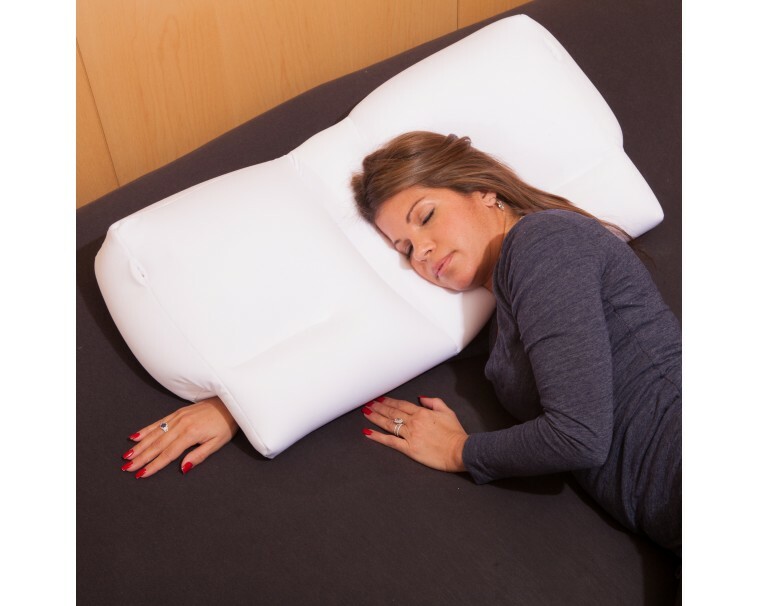 We guarantee this is the best pillow to sleep with or we will refund your payment. Any type of sleeper (side sleeper, stomach sleeper, etc.) when using the BSP can snuggle into their "Sleep Nook." Which is the position where you are most comfortable Throughout the night. Unique design features a lateral recess along the entire length of the pillow and a center tunnel for alternative arm positions and decreases pressure on your arm. The BSP provides support for your arm, head, and neck while also reducing shoulder discomfort, numbness, and tingling. People that suffer from sleep apnea and snoring benefit from the proper neck and spine positioning that helps opens airways. The BSP comes with a soft velour zippered pillow cover. Wake up free of that uncomfortable morning stiffness. Arm circulation is improved with the patented "Arms Tunnels Systems." The BSP is multi-positional and multi-functional. Back pain sufferers can wake up with less pain because of the decrease in tossing and turning at night. This BSP version is constructed of high quality, hypoallergenic cozy Microbead Cloud. We designed the BSP using only the highest quality materials with optimal cushion and support to ensure proper spinal alignment during sleep. We developed every aspect of the Better Sleep Pillow with close attention to detail and we placed priority on creating the most comfortable sleep pillow. People that have tried the BSP report a reduction in physical pain in the neck and back, as well as an overall better night's rest. Why wait to get the best sleep of your life? Don't suffer another tossing, turning, restless night when you add the Better Sleep Pillow to your cart now. I have a torn rotator cuff which is really painful, so I when I saw this arm tunnel pillow I thought I would give it a try. I'm really glad I did! This pillow keeps my arm stable while I sleep which prevents further injury and provides me with some relief. Prior to using this pillow I would awaken numerous times throughout the night with exceptional pain in both my shoulder and arm. Since I have been sleeping with this pillow I have been able to sleep at night and awaken with minimal pain. I'm glad I got the arm tunnel pillow! ! 5/5 Stars The perfect pillow for me! I didn't want to put much faith in this pillow, the price alone was the major obstacle. I've tried in the past to find a solid pillow but with three kids and life in the way, just couldn't justify the cost. I spent one night on this beauty and it was the first night,in quite a while, I didn't have a stiff neck when I awoke. I always sleep with my forearm under the pillow, supporting my head, so I appreciate the padded arm slot. I tossed less. My shoulder muscles weren't tight in the morning. And I felt refreshed. A negative, a slight one, the pillow when first opened has an awful smell. I had to wash the case twice before I felt comfortable with it. But that's a minor flaw, an awesome pillow! 5/5 Stars Best Pillow Ever! I was very skeptical about this pillow after receiving it and examining its structure. I was all set to write a snarky 1-star review about gimmicky over-priced "Sham-Wow" type products when I noticed something important. After using the Arm Tunnel Micro Cloud Pillow for the last two weeks, I'm sleeping better! I am a side-sleeper which puts me in the target audience for this product. I'm 64 years old and sound, restful sleep has gotten more elusive with each passing year. Even with this pillow, I still wake up a couple of times every night, but I feel that those intervals where I am asleep are deeper and more restful than with my old regulation, Queen Size, polyester-fill pillows. Because of its unusual structure, a standard pillowcase won't fit properly. The Arm Tunnel Pillow comes in its own specially designed case which opens via a zipper pull on the right side of the "thin" edge. I couldn't find laundering instructions for it, but I washed it in hot and observed no negative consequences. As far as this being a pillow for two, well, I could see newlyweds getting away with that but, honestly, that's the only case. I think it's a mistake for the manufacturer to market it that way. I suspect that they have done so as a way of justifying its cost, which is admittedly high. I suggest that you draw no conclusion after just one or two nights. Any pillow change, good or bad, requires time to get used to the difference. Give it a few nights before you decide. I find that I prefer to sleep off-center, to the right or the left, rather in the central "valley" of the pillow. I don't know if it's due to the "arm-tunnels" (I don't think so) or the "micro-bead" filling (most probably) or some other aspect of the pillow's construction, but the net-net is that I sleep better and, to me, that's worth 5-stars. EDIT 12/2013: On the unlikely possibility that someone might wade through the pages of reviews for this item and see this, I felt obliged to offer a status update. In early November of 2013, I awoke one morning to discover that most of the strength in my left arm had disappeared! A trip to the Emergency Room yielded a diagnosis of Cervical Radiculopathy--a pinched nerve in my neck. I had an MRI, and that showed that my neck was actually in pretty good shape. I'd had no recent neck injury. When I informed my doctor that I had changed pillows to this one a few months earlier, he felt that was the most likely culprit. I'm not changing my rating because there's no direct proof that the Arm Tunnel Pillow was responsible, but I thought I ought to mention it. I've switched back to my old Target pillow. When I opened the box and found this oddly shaped pillow I didn't know what to think. True, it looks exactly like the photo, but somehow it's a little more odd up close. I'll confess that I don't find the arm tunnel to be much of an asset. It never seems to be in the right spot for me. Also, I'm not buying the blurb that it is big enough to share. It's about the same a king-size pillow, and that's not sharing size to me. Still, I didn't get it with the intention of sharing it, so that was no big deal. I also was a little concerned about the beads inside because my history with beaded pillows is that they contour to much to my face and smother me. This pillow does not. There are so many beads packed in that they give to my head and body, but not to the extent that it curls around me. It supports instead, which I really like. The greatest benefit I have found is that it raises my head enough that it keeps my indigestion for popping up about an hour after I go to sleep. For the last six months, at least four nights a week I have woken up about an hour after going to bed with severe indigestion. I generally have to get up and sit for at least an hour before going back to bed, severely impacting my functionality the next day. In the 10 days I have been using this people, I've only had one night of indigestion. Admittedly, this is a small sample, but it is a huge deal to me. The manufacturer has made no such claim, and this is an unexpected bonus, but I'm certainly glad. The only other minor downside is that after 10 days, there is still a bit of a plastic-chemical smell when I first lay down. This has gradually diminished, and I expect it will go away entirely soon. I mention it, however, for those with sensitive noses. The Arm Tunnel Pillow Micro Cloud Pillow IS like a cloud. There is a zipper on the cover, so it can be washed. You do not cover the pillow with a case. That would defeat many of the benefits this pillow affords you. We deal with a lot of pain here. I know that a good night's sleep is critical to our well being. 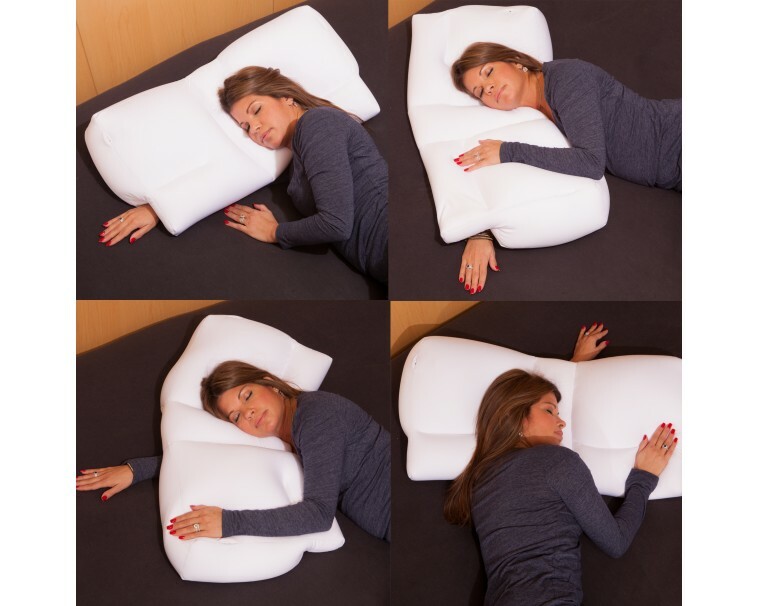 This pillow, specifically for people who live and sleep with pain, is very helpful, I think. I am not able to say that I am an expert(eg, orthopedic doctor, pain specialist) with a degree. The pain we have here is: fybromyalgia, osteoarthritis,bursitis, and neuropathy. My husband also has insomnia. He can hold it any way he wants and finds it to assist in easing night time pain. This pillow has been helpful with all of these chronic discomforts, in our case. 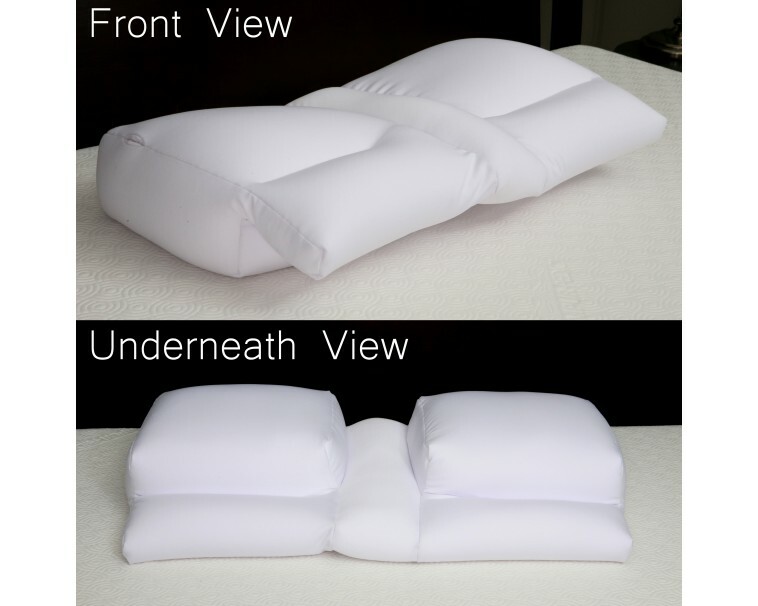 I would not suggest buying one of these pillows with the expectation of sharing it, despite the photos shown of a couple sleeping, using it that way, Yes, it can be used by two people due to the fact that it has channels which keep sections separate which means one person's weight on the pillow does not affect the other person's weight on the pillow. However, it is too small in my opinion, for use by two people. I think all the photos of this pillow make it look larger than it is. Read the dimensions and then compare them with a regular pillow. However, that is the only negative thing I have to say. Other than that, this is the most comfortable pillow I have ever had. We find it a blessing to have a pillow this great. Added after reading other comments: Yes, we smelled the smell. It goes away in around two days. Final note: it never loses its shape.